How much water does it take? 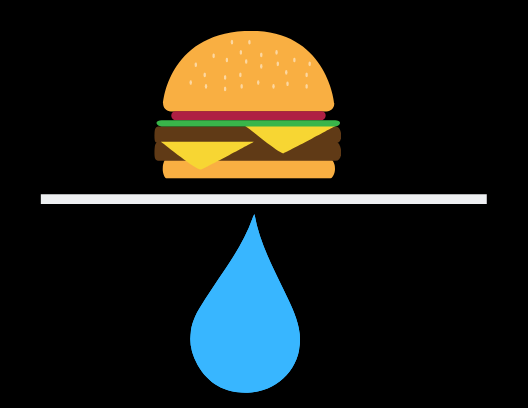 When all is said and done, a single burger takes an astonishing amount of water to produce. I’ve always been curious about the way my everyday choices affect the planet, whether it’s drinking almond milk instead of cow’s milk, or eating more plant-based meals to justify taking a longer shower. I’m particularly guilty of taking long showers. The good news for me is that forgoing a single eight ounce steak saves the equivalent of a 10-hour long shower! In fact, it’s not showers, or even watering lawns, that uses up the most water in households. It’s what we eat and drink - more than 1,000 gallons of water a day per person, according to several sources. That big steak? To calculate the water spent on it you have to factor in the amount of water used to irrigate the grains and grasses in cattle feed, slake a cow’s thirst, and process meat. Here’s a simple infographic I put together highlighting the average amount of water required to produce nine popular forms of protein. I didn’t list plant-based proteins, except for the almond and soy milk. Basically anything involving animals requires significantly more water to produce. l hope this info is helpful. I know I’ll never look at a cheeseburger quite the same way again.